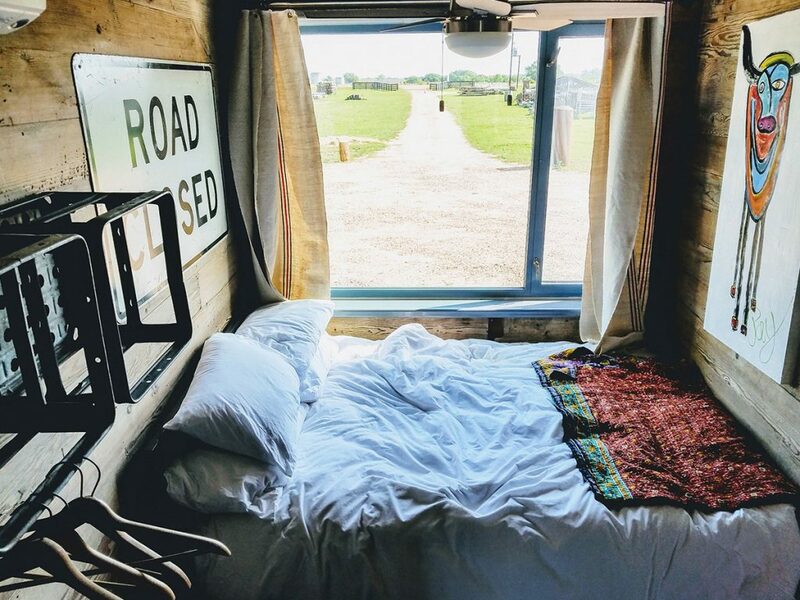 The iron boxes were recycled and renovated by Flophouze sometime in 2016 into cozy lodging spaces where people could crash in for the night after a hectic day. The hotel started out with three units, and three more were added in the subsequent year. Each unit is a separate space in itself with a kitchenette, bathroom,and furnished bedrooms. Read on to know more about the Round Top House and reasons why you should stay here this summer. A Flophouse by definition is a cheap accommodation space that offers only the bare minimum facilities and necessities required for a comfortable stay. The Flophouze Round Top in Texas takes this concept a step further. The boarding house in La Grange is both comfortable and practical. Here, guests can stay in separate units with their friends and family, away from the din of the city. What’s more, there is a hammock and a fire pit outside where you can arrange Barbecue parties, set up campfires or just spend a romantic night with your partner looking at the stars. The Flophouze Round Top is owned and designed by Matt White and his team of architects and designers. It is in partnership with another of White’s venture, Recycling the Past. The Round Top ballroom can be rented out for public events, corporate meetings and festivals. Opened to the public only recently in 2016, the hotel has become a popular vacationing spot for couples, solo travelers,and families. Round Top, a town in Fayette County was originally called Townsend after the early settler Nathaniel Townsend. Later, the town was renamed “Round Top” because of the round tower residence of the postmaster. This small but thriving community of Round Top hosts an annual antique fair every year ever since 1967. In 1998, Matt White, an art lover, anarchitect visited Round Top with his friend Mark Dooley. After that, he was hooked. Back then, White was heading his organization Recycling the Past in New Jersey and would often make a trip to Round Top. 16 years later, White finally opened a second headquarters at the Round Top Ballroom (which also served as an event venue). Flophouses have been popular accommodation spaces for budget travelers. The idea of building a flophouse was conceived sometime during the initial visits to Round Top. However, this idea was executed years later in 2016, when White collaborated with a group of architects and build what is now known as an eco-friendly boutique flophouse. The 12000 sq. 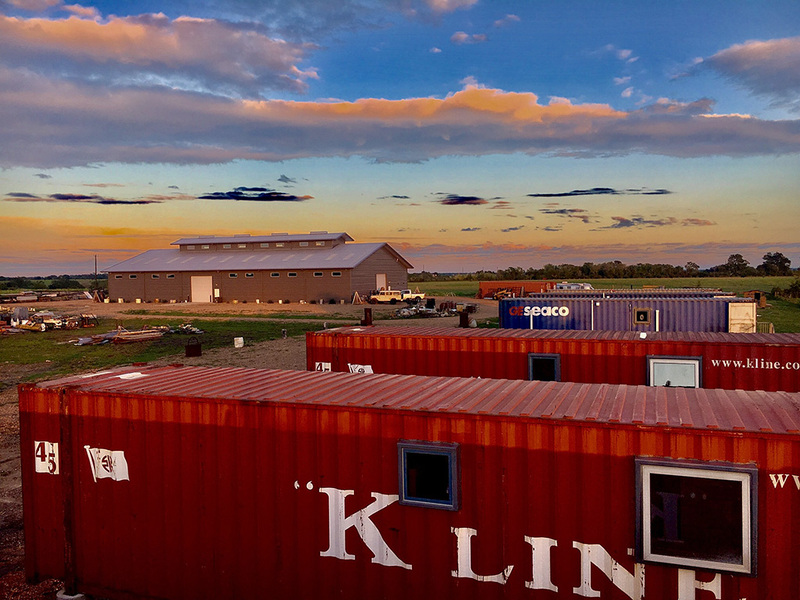 ft. facility and the neighboring grounds feature 6 shipment container houses and a common fire pit. Other than that, the houses also incorporate some antiques and architectural salvages. White has announced plans of expanding and adding more units to the flophouse and also to incorporate several other facilities in the near future. The flophouse units at Round Table La Grande Texas are but a collection of habitable and cozy shipment boxes. The iron containers were salvaged and recycled from old dockyards and dumping sites. A team of dedicated architects then gave these boxes a makeover, constructing living spaces from them. The outside of the flophouse is pretty simple and traditional. There are 6 units, each built on a separate theme and design. The metallic sheets and refurbished hardwood doors and window sills are all salvaged by White and his team from Recycling the Past. Each unit features a bedroom, a bathroom, and a kitchen. Other than that, there are open fire spaces, a private jacuzzi, and an eating house in the hotel premise for the comfort of the guests. The Flophouzeis set in the small town of Round Top, in the outskirts of Texas. The Austin-Bergstrom International Airport is 56 miles away. Other nearby attractions include the Round Top Mercantile Market, Teague’s Tavern and the Village Market that is but an hour’s drive away. Flophouze, the brainchild of Matt White is classic space for history buffs and vintage lovers. The rooms are lined with 600+ album collection of vinyl records, salvaged décor pieces, recycled furnishings,and antiques. The interiors are in sharp contrast with the external architecture. 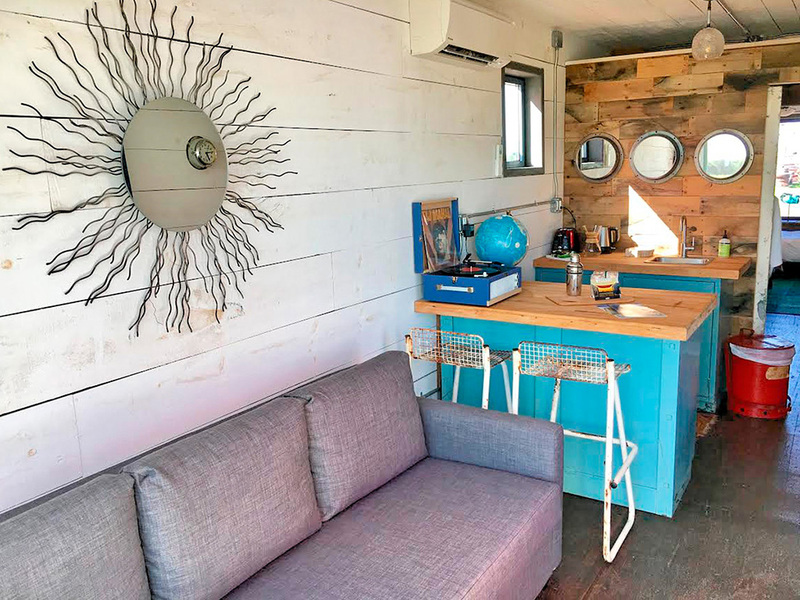 One wouldn’t really expect a recycled iron box to look chic and quirky on the inside. The rooms are quite spacious measuring about 300sq. ft. with a large bed, a side table, a couchand even a walk-in closet! The bathing spaces are reminiscent of the retro showers with mosaic tiles and transparent shower curtains. Other than that, you get a curling iron, complimentary toiletries,and a hairdryer. The kitchen is equipped with all the modern electrical appliances you’d need, there’s a well-stocked refrigerator, microwave,and a tea kettle. Everything about the place is eco-friendly. The hardwood flooring is made from harvested wood in an upstate New York farm. The window panes are salvaged from a demolished school in Philadelphia. Even the countertops and kitchen cabinets are made from the refurbished wood of an old bowling alley floorboard! The area of Round Top in La Grande, Texas USA is a small town with a population of just 90 people. The town is known for hosting the best antique show in the nation. It all started back in 1967 when a group of 22 dealers collaborated to setup the then first Round Top Antiques Fair. The fair is held twice a year- in October and in April. And while you’re here, don’t miss out on the thrift shops and local stores where you can get junk jewelry, bohemian accessories, art collectibles and other trinkets at a good bargain. The visitors can lodge in the nearby flophouse III. The boarding house has 6 units, each a separate entity with its own bedroom, bathroom,and kitchen. There’s a hammock and fireplace outside where you can meet and greet other inhabitants of the neighboring flophouse. And if you want to further expand your social circle, we suggest you pay a visit to the Round Top Music Festival held in the ballroom nearby. However, the Flophouse for all its festivities is a pretty private space that is far away from the chaos of urban life. 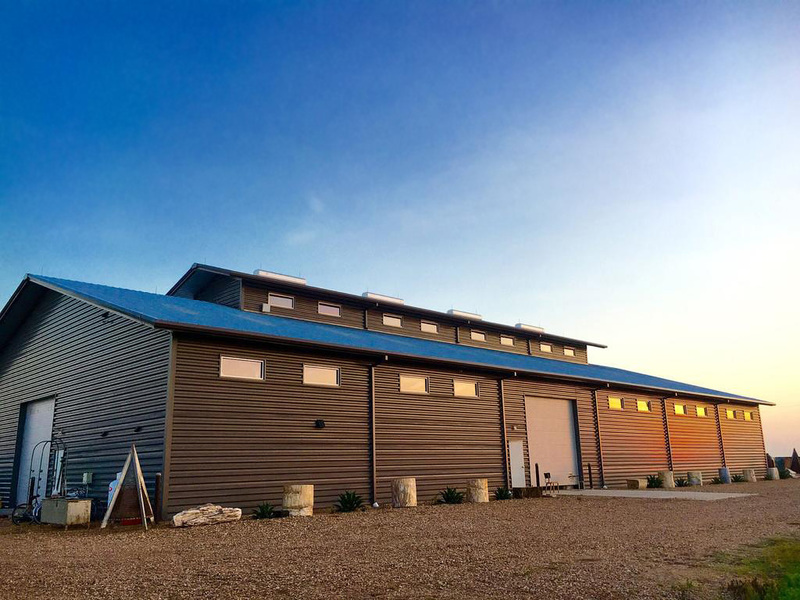 In the small town of La Grande, Texas guests can enjoy the authentic community experience. The local fairs, eating houses and other attractions have a very vintage charm to them. It takes you back to the good old days of a simpler life that was untouched by the complexities of urbane lifestyles. FlopHouse III Round Top is among the few lodging spaces that offertravelers the best of comfort and style. Sure, the architecture is not conventionally aesthetic, but one cannot deny the vibrant and quirky design of the place that immediately makes you feel at home. Here are a few interesting facts and trivia about the place that you should know about. The Festival Hill Concert is an international music festival organized in the concert hall and displaying an amazing collection of architecture and local talent. The property is pet-friendly, albeit at extra charges. There are special trainers and caretakers to look after your furry friend in your absence. Currently, there are six flophouses available to guests. However, the owner has announced plans for expanding the units and launching new ones in recent future. 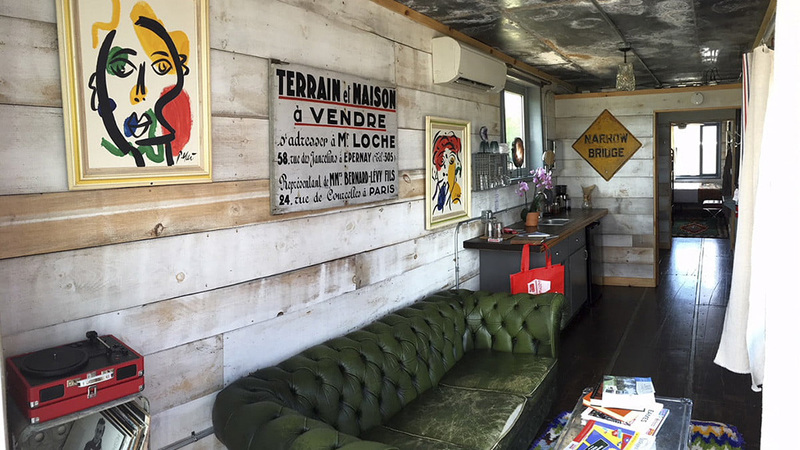 We’ve all seen or at least heard about shipping container homes, but not many of us can claim to have stayed in one. 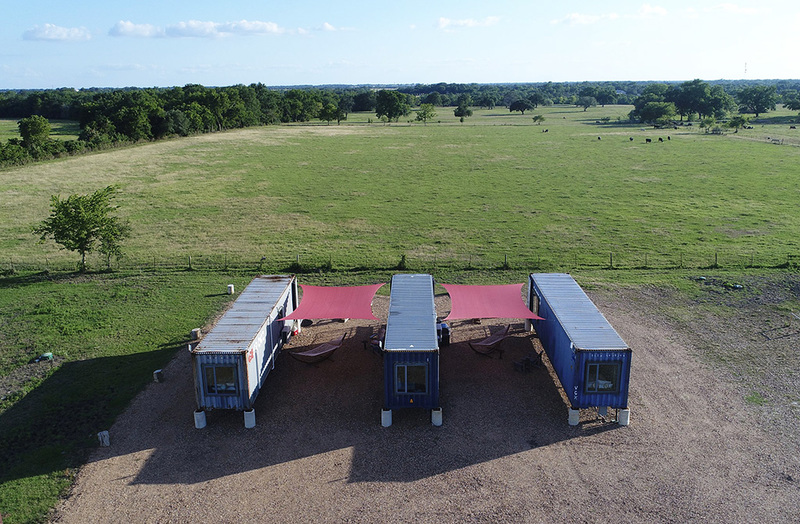 The FlopHouze Round Top in Texas gives you an opportunity to actually experience the thrills of lodging in a recycled shipping container. These sturdy and durable iron boxes are eco-friendly, practical and surprisingly comfortable. Everything is tailor-made to suit your needs and ensure that you have a safe, memorable stay.